← AM/PM Exterminators offer pest control services. Expert Pest Control Service Provider, AM/PM Exterminators offers affordable mice infestation control system that is not only effective and helps clearing any site from mice, but it is also family and pet friendly which means that AM/PM Exterminators make sure that they only use high quality products and latest methods that are safe for humans and pets. This is the reason AM/PM Exterminators is widely-trusted and recommended in Seattle. Get Rid of Entry Points In attics and crawlspaces of homes or commercial business buildings. One of the most effective ways to get rid of rats in attics or crawlspaces is to get rid of entry points that can be used to access homes or building. This means that any tree branches that homes upper-exterior should be trimmed. Trim tree branches and foliage that are within a few feet of homes upper-exterior, as rats can often jump up to a foot in distance. Inspecting for holes is another key step in removing access. Look for any holes attics walls, as well as its roof; remember rats can chew through wood-based materials with ease. Seal them off with metal sheeting or concrete so that rats can’t chew through the seal to regain entry. “We use only non-toxic pest control products so that you are left with a safe & fresh environment, rid of the unwanted pests in your home. We use well tested and proven treatments that are both effective and efficient in preventing and controlling pest infestations. Our cutting-edge technologies ensure that our client’s facilities remain pest-free in a sustainable way,” stated the spokesperson of AM/PM Exterminators while discussing the family and pet friendly effective pest control services of AM/PM Exterminators. Getting Rid of a Mice Problem in Seattle is a hefty job because there are not many trustable infestation control service providers available. And the ones that are available, are either very expensive or they are not effective enough. That is why customers of AM/PM Exterminators widely recommend the efficient and effective services of AM/PM Exterminators and they agree that rather than wasting a lot of time and money on other pest control service providers, one should hire the professional services of AM/PM Exterminators. “For premises with rodent infestations, our team of pest control experts conducts a thorough inspection to determine the kind of rodents present and their species. Based on the outcome of the inspection, our team develops and implements and effective program that rids your premises of the rodents. We either use trapping, exclusion or baiting to control infestations and in some instances, all the three methods are applied,” stated the spokesperson of AM/PM Exterminators while discussing AM/PM Exterminators’ expert infestation control services and its rates. He further added that they also offer removal and replacement of rodent-damaged insulation in attics and walls. So with AM/PM Exterminators one would never have to worry about field mice control because AM/PM Exterminators will take care of it all in the most cost-effective way possible. So now, without wasting any more precious time and money on other pest infestation control service providers, one could try considering investing it in AM/PM Exterminators; and as guaranteed by AM/PM Exterminators – get the best result in lesser time and amount of money. Commercial Office Buildings, Hotels, Hospitals, and Retail Stores. Commercial buildings are constructed from types of materials and design methods that vary greatly in the degree of susceptibility to rodent infestation (for example, metal and concrete versus wood). Most structures eventually become less rodentproof due to deterioration, alteration, or repair. Heating, air conditioning, plumbing, electrical service, and fire sprinklers provide some of the most commonly encountered rodent entry points. Rats, mice and other rodents can become a nuisance when they come in close proximity to humans. In addition to spreading disease to both humans and household pets, rodents can also cause property damage and contaminate food sources. Rodent pest Control specializes in rodent control and removal to help you get rid of rodents in your home or business. A variety of lethal and non-lethal techniques, including exclusion, habitat modification, and trapping are available that may effectively control these pests. AM/PM Exterminators is a professional pest control company that provides expert infestation control services for treating bed bugs, little black sugar ants, carpenter ants, rat control, house mice, rodent control, birds, beetles, moths, flies, termites, wasps, yellow jackets and hornets’ infestations. 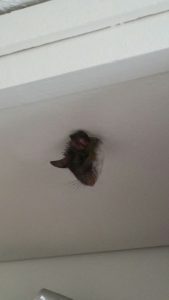 This entry was posted in Attic Rodent Restoration exterminators, Commercial extermination services, Commercial mice exterminators, Commercial pest extermination services, Commerical pest control extermination. Bookmark the permalink.